Paid Search Marketing (aka Search Engine Marketing, or SEM) is the branch of search marketing where you pay to be included on the sponsored listings area of a search engine or a partner site. Perhaps the most popular example of paid search marketing are the ads you see on the top of the Google search results page when you search for a product or service. 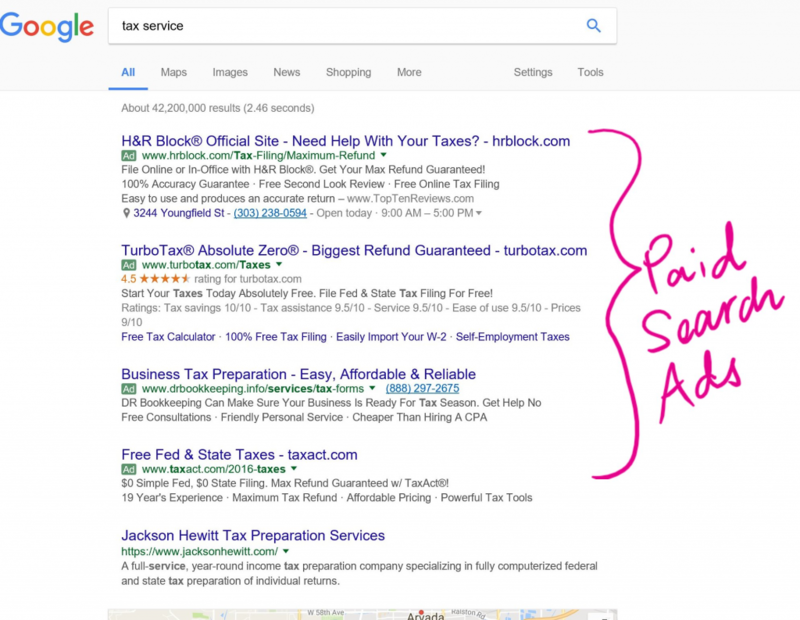 Paid search ads above the organic or natural search ads on Google. Paid Search Marketing is one of the quickest way to jumpstart a business and to get a customer base growing . You can laser target your customers. What are your customers demographics? What age? What region? What keywords would they type in the google search bar to look for your business? These are just some of the things that we will identify to design the best paid search marketing campaign for you. By doing this, we can target those ready to buy your services or products & eliminate wasteful spending. Our paid search marketing experts will utilize campaigns that are cost-effective.